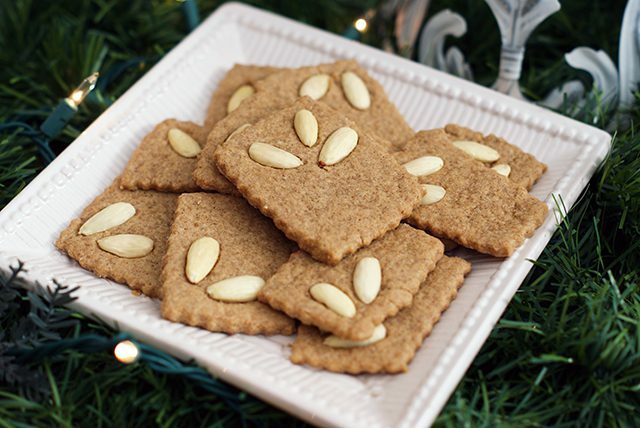 Dutch speculaas are thin, crisp cookies flavored much like German pfeffernüsse. They’re typically baked for St. Nicholas’ Day on December 5th or 6th and are, traditionally, stamped with images from the life of St. Nicholas on the front. It turns out that I really like traditional Christmas cookies from this part of Europe, with their strong spices and unique textures! I didn’t want to invest in a speculaas stamp at this time, so I made mine with a more modern flare — rolling them out flat and pressing blanched almonds in their corners before baking. In a medium bowl, cream together the butter, brown sugar and vanilla. In a separate bowl, combine the spices, flours and baking powder. Mix well. Add the dry ingredients to the wet ones and mix well. Add milk and mix until smooth. Divide the dough in half and form two discs. Wrap each disc in plastic wrap and refrigerate for an hour or more. When ready, preheat oven to 325 degrees F.
Remove one disc from the fridge and roll out to 1/8″ to 1/4″ thick. Cut into shapes and press almonds on the surface. Transfer to a cookie sheet or stone and bake for 15-18 minutes until they’re dry and beginning to brown. Let cool for 5 minutes before moving to a cooling rack. I love all the spices in Speculaas too! I’ve made them before in a 9×9 pan, which makes them much easier to create (and nice and moist). Now that you’ve reminded me about them…I’ll be making them for myself (and my family) soon :-). I was surprised by how many varieties of speculaas I found while researching them – speculaas cupcakes and muffins, cookie bars like you described, etc. They all sound delicious! 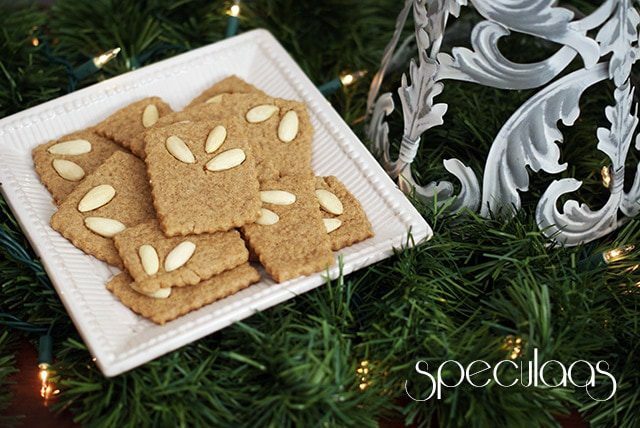 I tried making Speculaas last year too, and I LOVED the result! Dug around for a while trying to find a good stamp online or kijiji (I found some AWESOME antique ones but they were too far and too much :p). Now I’m going to try your recipe since you’re making me want them again!